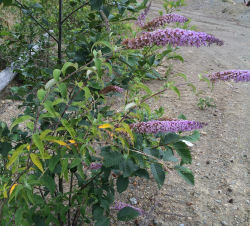 "Buddleia davidii is a deciduous Shrub growing to 3 m (9ft) by 3 m (9ft) at a fast rate. It is hardy to zone (UK) 5. 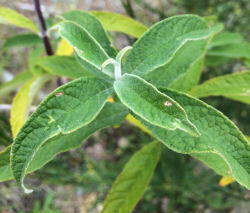 It is in flower from Jul to October, and the seeds ripen from Sep to October. The flowers are monoecious (individual flowers are either male or female, but both sexes can be found on the same plant) and are pollinated by Bees, lepidoptera.It is noted for attracting wildlife." "Suitable for: light (sandy), medium (loamy) and heavy (clay) soils, prefers well-drained soil and can grow in nutritionally poor soil. Suitable pH: acid, neutral and basic (alkaline) soils and can grow in very alkaline soils. It cannot grow in the shade. 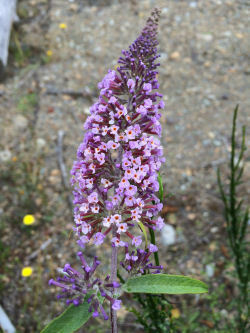 It prefers dry or moist soil and can tolerate drought. The plant can tolerate maritime exposure." Contains Balanophonin, Buddledin A [EncyTCMV.1], Isomartynoside, Jionoside D [EncyTCMV.3] and Plantainoside C [EncyTCMV.4].